This image represents actively growing bone. Patches of primary bone (or woven bone) are remnants of initial bone formation, formed without the characteristic lamellar structure of remodelled bone. 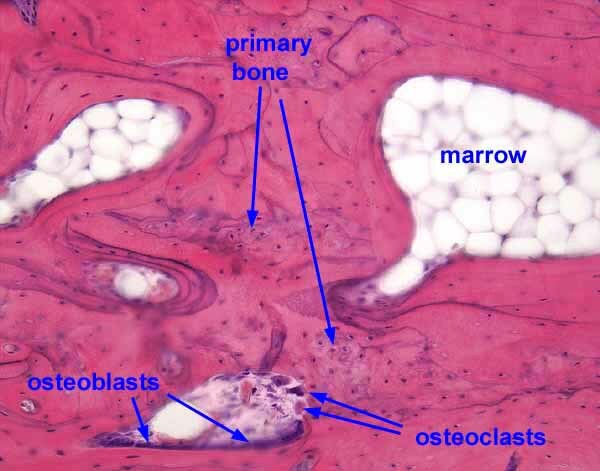 Near the bottom of the image is a cavity where osteoclasts are digesting away some of this primary bone, while osteoblasts (out of focus) are laying down new bone. The thin, dark lines which curve through this image, parallel to adjacent lamellae, are cement lines which mark sites where new bone formation was intiated. The tiny dark "specks" within lamella represent osteocytes. Choose the thumbnail at right for an overview, or choose from among the thumbnails below for additional views.